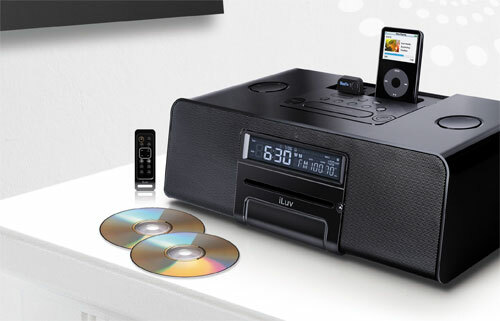 It’s not that the iLuv i199 iPod Speaker System doesn’t work, it simply tries to do too much. The result is a frustrating user experience exacerbated by a clunky remote and unintuitive controls. Sure, it has two programmable alarms that can use your Apple iPod. It can also play MP3s directly off a USB thumb drive. 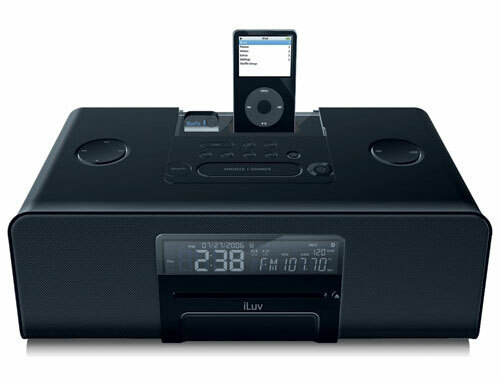 It plays your CDs (including data CDs), too, and it has a radio tuner. The speaker is even Bluetooth-capable. Trying to navigate these features via the remote, however, is a lost cause. That’s because the membrane buttons rarely work, and it is often hard to figure out what button is in charge of a specific function. In short, there are plenty of iPod docks available that are much better, even if they have fewer features. The iLuv i199 has a striking, polished black contour, but it is probably too bulky to win any design awards. At roughly 15 by 7.8 by 5 inches and with a substantial weight, you’ll need a sturdy bookshelf or a lot of space on your desktop for this one. iLuv also covers the i199 in stickers that are hard to peel off. I sincerely hope that my review unit is an anomaly. If not, be prepared for “sticker shock”—and to use Goo Gone to get rid of it all. The front face of the i199 has a 5- by 1-inch LCD display with a CD slot below it. This LCD displays the time and date, as well as whatever information it can about the music or radio station you’re listening to. Sometimes this means artist name and song title, other times you get only a track number and countdown clock. Most of the controls are on the top of the device. Open the lid to reveal the iPod dock, USB drive dock, and the BluePin connection (BluePin is the company’s proprietary Bluetooth technology). Below them are buttons controlling the alarm, time, radio, memory (not internal memory—this is for programming CD tracks), play mode, sleep, and the vaguely titled yet most important button on the device: Function. Below these sits another row of buttons: Wake To (your alarm settings), Snooze/Dimmer, and Alarm Off (which is also the power button). On either side are circular buttons that on the left control skipping, play/pause, stop, and presets and on the right control volume. The rear panel has, from left to right, FM Antenna, Aux in, AM antenna, and iPod A/V Out. The dock comes with an FM antenna, an AM antenna, a lousy remote, a 3.5mm-to-RCA A/V cable, a 3.5mm stereo-out cable, iPod dock adapters, and a fairly thorough manual. The i199 does pack fairly powerful speakers that can get quite loud without distorting much. The overall sound quality is pretty good, with crisp mids and highs. There is not much bass presence, but the low end is not sorely absent, as it is on, say, the Eos Wireless speakers. The bottom line is, however, the speakers don’t blow me away. If they did, many of the unit’s design flaws could be forgiven.